The acting of Benedict Cumberbatch is one of the reasons to go see this film. Another reason is this. 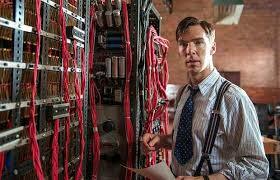 The Imitation Game is a movie about ideas and how they are incubated. The notion to invent modern day computers didn’t just pop out of Alan Turing’s head. The film emphasizes the amount of hard work and the blood, sweat and tears of many people who fought to create something extraordinary. Ideas such as the ones that made the machine that broke the Enigma code possible only came about when some were willing to fight for their visions. My one criticism would be the part of the film that dealt with Alan Turing’s homosexuality. It seemed to be slapped together to complete the story somehow. But the more interesting part of the film deals with the culmination of the brain child of Alan Turing and the accompanying risks and responsibility the knowledge of the code entailed. The men and women who worked on this project were not able to speak of it for decades. There was no glamour or glory for these people. It was a hard fought slog of a war, and the action of this film, quite naturally, takes place within the confines of a quiet town in the English countryside. The dramatic license found in all works of Hollywood fiction make up a small portion of the action, but there really is no melodramatic dilemma found within the story of the Enigma code breakers. The fascination is found within the confines of the mind of the visionary Alan Turing character. Which is why only an actor such as Cumberbatch could play such a man. Some of the unlikeable elements of his quicksilver-tongued Sherlock appear in the Turning character at times. But the bulk of the film is carried by Cumberbatch’s focus on the single-minded dedication to detail seen in the makeup of Turing. Out of a very poor season, and frankly a stunningly slow year for movies, this film stands out in the crowd. Now up for Best Picture, as well as Best Actor for Cumberbatch and Best Supporting for Keira Knightley, this is one film that easily wins my vote. Go see this movie.